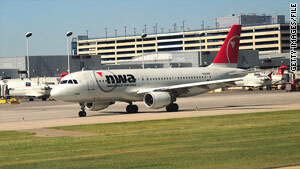 The Northwest Airlines pilots who flew past their destination lost their licenses, but can reapply for them. Washington (CNN) -- The pilots of Northwest Flight 188 did not fall asleep when they overflew their destination by more than 100 miles in October, the National Transportation Safety Board said Thursday in a detailed report on the wayward flight. The two pilots "became distracted by a conversation" about the airline's new work schedule system and by laptop computers they were using in violation of company policy and did not communicate with air traffic control for about 1 hour and 17 minutes while they cruised past their Minneapolis, Minnesota, destination at 37,000 feet, the NTSB said. The safety board also faulted the Federal Aviation Administration for air traffic control shortcomings. The NTSB report gives the most complete official account to date of the errant flight, which prompted the FAA to revoke both pilots' licenses, prompted the airline to suspend them from flying and prompted the FAA to adopt new procedures to notify the U.S. military in cases where the FAA loses contact with commercial aircraft. According to the account, the flight from San Diego, California, was routine until the plane was in the Denver, Colorado, region. There, air traffic controllers directed the crew of the Airbus A-320 to change their radio frequency. The co-pilot, or first officer, acknowledged the frequency change and read back the correct frequency. However, neither the captain nor the first officer contacted controllers on the new frequency until about 1 hour and 17 minutes later, when Winnipeg, Manitoba, controllers directed the crew to contact Minneapolis. The NTSB said that because of the proximity of the Winnipeg frequency to the last frequency acknowledged by the pilots (Winnipeg is 132.125 megahertz, while the last frequency used was 132.17) it is "likely the first officer began to dial in the new frequency but never completed the frequency change by pushing an activation button. Nor did the first officer attempt to contact the next controller." The NTSB said the frequency change likely occurred while the captain was taking a restroom break and while a flight attendant was serving dinner. "These events may have distracted the first officer from completing the frequency change or attempting to contact the next ATC controller," the NTSB said. Further, the captain's absence would have prevented him from checking the co-pilot's actions. When the captain returned, the pilots became involved in a conversation over new scheduling procedures, and the first officer tutored the captain using their computers, the NTSB said. "The pilots allowed this conversation to monopolize their attention," the board said. "Both pilots state that they heard radio chatter but did not hear a radio call for NWA188." The laptop computers they used likely blocked their view of numerous visual alerts, including text messages sent by airline dispatchers and at least nine messages regarding their position on the airplane's primary flight display, the NTSB said. Northwest Airlines policy prohibited the use of the laptops, the NTSB said. Both pilots told the NTSB the first indication of anything unusual was when a flight attendant called to ask about their arrival time. The captain "looked at his navigation display and saw Duluth [Minnesota] to his left and Eau Claire [Wisconsin] to his right," the board said. The NTSB said it could not determine why the pilots did not respond to numerous radio calls, but said it could be because the volume was turned down, the pilots were distracted or the plane was outside the coverage for the 121.5 megahertz transmitters. The NTSB faulted the FAA for not catching the pilots' errors earlier, saying the plane entered two Denver sectors uneventfully, but radio contact was not established in the next two sectors, where controllers were preparing for a shift change. "Neither sector controller's relief briefing included information that communication had not been established" with the plane, the NTSB said. The NTSB said the FAA had no standard procedures to indicate that an aircraft had not made radio contact when electronic radar handoffs of planes occurred from one sector to the next. "Because of this lack of standardization, NWA188 passed through two Denver ATC sectors without the controllers being aware that it had not made radio contact," the safety board said. Almost 30 minutes had elapsed before the next sector's controller attempted to regain contact with the plane and realized the plane was unresponsive to radio calls, the board said. Recognizing the problem, controllers first attempted to regain contact by calling Northwest dispatchers, then by calling an emergency frequency, but did not use words such as "emergency" or "mayday" that may have helped capture the pilots' attention, the NTSB said. The pilots did not respond. As a result of the investigation and of the crash of an executive jet in Montana in 2009, the safety board is recommending steps to prevent a repeat of the incidents. Six days after the event, the FAA revoked the licenses of Capt. Timothy Bryan Cheney and First Officer Richard Irwin Cole, saying their lack of awareness that they had overflown the Minneapolis airport was "completely unacceptable" and "put your passengers and your crew in serious jeopardy." But in a settlement signed with the pilots on Monday, the pilots acknowledged no wrongdoing, and the FAA agreed to allow the pilots to reapply for their licenses in August, two months shorter than would ordinarily be allowed. A spokesman for Delta Airlines, which merged with Northwest, said this week the airlines' internal investigation is continuing.